Welcome back to my release party! I’m getting a little serious here, so if you want to skip down to the excerpt I’ll understand. It’s a little serious too, though, so I wanted to warn everyone. The book deals with some serious and potentially triggery subject matter, and this is just a little hint at what Phil and Lee have to deal with before they get their HEA. I’ve seen a few authors in this wonderful genre we all love talking about giving characters happy endings that the people they knew in real life weren’t able to enjoy. 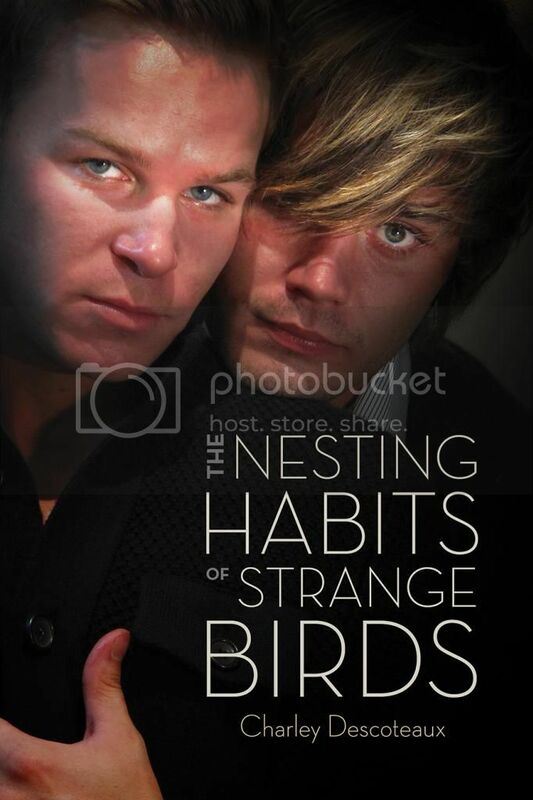 The Nesting Habits of Strange Birds does that, in a way. Parts of Phil’s backstory are taken from a friend of mine who spent some time in foster care during her childhood. She and her little brother were taken from their mother and spent a few weeks in separate foster homes. Luckily, their grandmother fought for custody of both kids. My friend’s story started me thinking about all kinds of “What if” scenarios. But those are way too spoilery to talk about. I can’t talk about nothing, though (not for long, anyway ), so I’ll talk about a real-life issue—the lack of services and safe spaces available for LGBTQ youth. Even in places known for being liberal, LGBTQ youth (and adults, for that matter) have problems with acceptance, which often leads to unstable life situations. Oregon is no exception. Depending on the study you read, at least half to two-thirds of Oregon’s homeless youth are LGBTQ. Places like Outside In, and SMYRC (Sexual & Gender Minority Youth Resource Center) are among the organizations doing great work to change that in the Portland area. SMYRC is a program of Portland’s Q Center, and they provide youth aged 12-23 with a safe space to hang out, participate in activities from community involvement to music and art, and access services from life skills education to job readiness and counseling. They also provide a lot of the basic necessities of life that most of us are lucky enough to take for granted, like toiletries and warm winter clothes. Last year I spent almost five months knitting and donated a large bag of hats, scarves, and mitts during their annual clothing drive. I didn’t have money to spare, but I had yarn! As soon as the NFL pre-season gets going I’ll be back at it. Charity knitting in front of football games is one of my favorite things about the fall. Do you have a favorite charity that helps LGBTQ youth? If so, I’d love to hear about it. If you give or volunteer there, I want to hear about that too. Toot your own horn, and help raise awareness of all the great work being done around the world to help our kids grow up knowing their worth. They sat in silence for a few minutes. Phil thought Jerry was waiting for him to ask another question. He had one but wasn’t sure how to ask it. Phil shook his head, scooted back on the bed, and pulled his legs up under the folds of his robe. Phil thought about it longer than Jerry could stay in that position. Jerry stood and stretched his back, hung his sport jacket in the closet, and sat in an old wing chair on the other side of the room. Jerry’s tone suggested he wanted Phil to turn around, so he did, and then scooted near to where he sat. Jerry had a knack for making things sound simple. Not easy, but simple. Phil swiped at his cheeks, but even though they burned, they were dry. Jerry stood and slowly approached the bed. Phil looked up, and when he realized Jerry would hug him, his eyes stung, but at the same time he felt like smiling. When Jerry wrapped both arms around his shoulders and pulled him close, Phil hugged him back. They stayed like that for a few minutes, and then Jerry moved away the half step he usually let stand between them. He smiled and then sniffled. Phil wasn’t sure what Jerry was thanking him for and didn’t want to ask. The day had been exhausting, and he was ready to burrow into bed and read until he fell asleep. He was relieved when, after a moment’s pause to give him a chance to ask another question if he would, Jerry turned the conversation to food. Don’t forget to comment with your favorite LGBTQ youth-based charity for a chance to win a copy of Strange Birds or a charm bracelet and your very own strange bird! Rattle my cages, I’d love to hear from you! I live in a state that does little for LGBT youth, unfortunately. I help out by supporting the Trevor Project. I know of groups that supports local university students and there is a group called SexYouAlity and part of a larger group called Consortium. This group started out as 2Byou and still does support young LGBT people under 25, and offers courses to local schools, but now they have expanded to support all LGBT age groups. There is a also a council run group called Connextions, which support all young people and also give advice to help etc and a counselling service called Centre 33. I should have said that the group is a charity and is run by volunteers. I’m not aware of many youth based charities. I usually just donate to the Trevor Project.